Insects as Food. Future Food Salon. Photo Lisa Vlasova. Silence reigned save for the chirping of crickets as trendy guests slowly milled about. The experience began upon entry of the grounds shared by the Insectarium with Montreal’s Botanical Garden. Swiftly darkening skies couldn’t put a damper on the place’s beauty: the first light installations in view of the annual Magic of Lanterns festival imbued the scenery with fairy-like charm. Within the pavilion, Torontonian artist Marjan Verstappen’s striking Pollinate/Illuminate exhibit served as the backdrop to the main attraction of the evening: insects dead and alive. marjan verstappen pollinate illuminate. Future Food Salon. Photo Lisa Vlasova. Montreal rose to the occasion of the Future Food Salon with success: original local fare was proudly showcased in order to prove that bugs are not only nutritious, but delicious! Cook Caravan served an exotic salad based on authentic Thai street fare: seasoning included garlic and crisp cricket bits; reputed Limon chef David Ali Garcia served tacos both savory and sweet with cricket toppers; uKa protéine offered samples of their latest pineapple-almond-mealworm bars. Visiting companies also gave attendees a chance to excite their taste buds, giving samples of products available for purchase at their booths: Micronutris from Toulouse, France sold cricket chips, mealworm flour and prebaked cookies in a variety of flavours; Big Cricket Farms served 20% cricket pesto beside the bags of dehydrated insects up for sale to show that the arthropods are recipe-versatile. This reporter, having judiciously tested everything on offer, formed a clear opinion on bugs as munchies: yes, yes, and thrice yes! 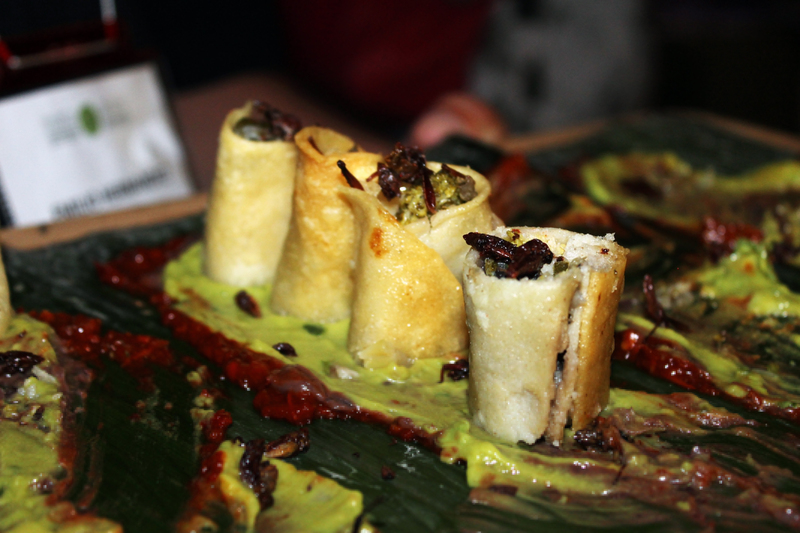 Although most recipes were relatively low in insect content, so as not to alienate the visitors cautiously curious about the self-proclaimed food of the future, I can attest that whole crickets are in texture akin to pleasantly crunchy popcorn and in aroma like oil they’re cooked in. Mealworms, on the other hand, are soft and meaty. Like rice, it’s all about the spices you prepare them with. Mealworms. Future Food Salon. Photo Lisa Vlasova. However, the Future Food Salon doesn’t skimp when it comes to food for thought. Kevin Bachuur, owner of Big Cricket Farms, despite cheekily citing “‘cause all the cool kids are doing it” as a motivation for starting up the first American business devoted exclusively to raising insects for human consumption, soon delivered a sobering second answer. During his travels in Asia, he was shell-shocked by seeing the day-to-day reality of food insecurity. “It’s one thing look at the number, and another to see half of a population starving. The remaining population, that is,” he stated. 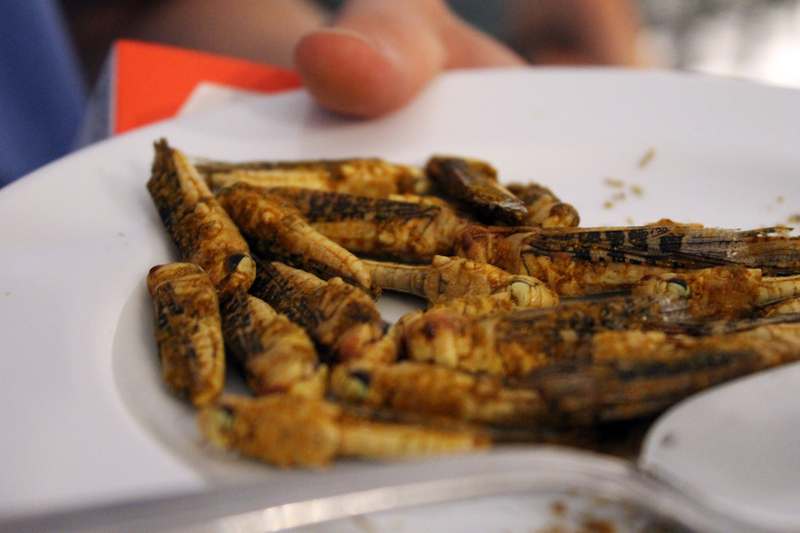 Fried insects as Food. Future Food Salon. Photo Lisa Vlasova. That’s where Jakub Dzamba, inventor of the self-contained cricket-rearing farm unit, comes in. His Circle Chirp, which made its debut at the event can be used for both domestic and large scale farming, is odor- and escape-proof, and struck me as the most sensational sight of the soirée. We now live in a time when cocktails take place to the chirping of crickets brought out of the shadows and into the urban farm, where questions like “Where has it been?” and “What has it eaten?” apply more to the mistreated cattle on antibiotics than to roasted, wholesome organic… Insects. Guest admiring the cricket chirp beta version. Future Food Salon. Photo Lisa Vlasova. 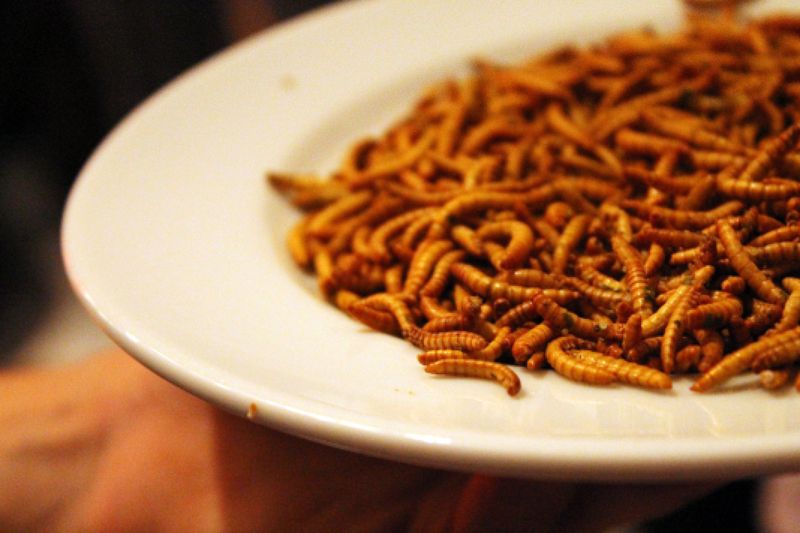 Lisa Vlasova, the author of this article, highly recommends that you give Edible insects: Future prospects for food and feed security a glance at http://www.fao.org/docrep/018/i3253e/i3253e.pdf if your curiosity was sparked and you would like to read more about the benefits of entomophagy, or the consumption of insects as food. The Future Food Salon took place on August 27 at the Insectuarium.